August 17, 2000 -- Follow the countdown and launch of a U.S. Air Force Titan 4B rocket with a classified payload for the National Reconnaissance Office. Reload this page for the very latest on the mission live from Vandenberg Air Force Base, Calif. 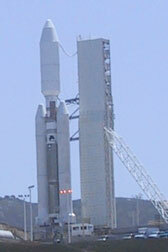 The Titan 4B rocket sits poised for liftoff Thursday. Top Photo: Justin Ray/Spaceflight Now. Launch site: SLC-4E, Vandenberg AFB, Calif. Launch preview - Read our story for a complete preview of the Titan 4 launch. Titan 4B - Description of America's most powerful unmanned rocket. 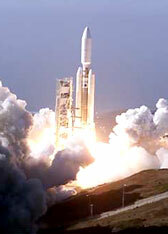 A video produced by the U.S. Air Force shows the Titan 4B rocket launching on Aug. 17 through ground and aerial cameras. USAF video of Titan 4B rocket's first stage igniting and spent solid-fuel boosters separating to fall into the Pacific. The U.S. Air Force Titan 4B rocket lifts off from Vandenberg Air Force Base in California with a classified spacecraft for the National Reconnaissance Office. Tracking cameras follow the Titan 4B rocket as it heads away from Vandenberg Air Force Base. An infrared tracking camera atop the Santa Ynez peak sees the Titan 4B rocket's first stage ignite and the twin solid rocket booster separate. What is believed to be a Lacrosse radar imaging spy satellite is seen in a Lockheed Martin clean room in 1998. This could be the same craft being launched. From our history archives is the October 1997 launch of a Titan 4 rocket with the third Lacrosse radar imaging satellite for the NRO. Look back into our history file and watch a U.S. Air Force Titan 4 rocket lift off in daylight from Vandenberg Air Force Base in California.